It certainly allows me to sleep easier at night knowing Google likes my content and wants to push it to the top of the SERPs. Forget the old style keyword-focused SEO where you pick a keyword phrase you want to rank for, and optimize your page around that specific term and a few of it's synonyms. That type of SEO does not work anymore, and can get your entire site penalized or removed from Google! Since 2005, I've been using my own methods involving theming content. At first, SEOs laughed at my “naivety”. What I was doing at the time was way above and beyond what was necessary at the time, but it worked. I didn't care that my methods were flying under the radar of other SEOs. My strategy was, and still is, build for the future, not just the here and now. In truth, my methods were light years (in internet terms) ahead of the competition, and only known to my newsletter subscribers, and early adopters of Web Content Studio, which was released in early 2009. Today, Latent semantic indexing, LSI, theming (all the same thing), is common practice and generally accepted. We'll look at LSI and theming a little more in a moment. But first, I have a myth to dispel. My Web Content Studio software was released several years ago (and has had several hundred updates since) to help website owners create well themed content. Some people think that because the software was released so long ago, theming and LSI are no longer relevant in modern SEO. I recorded a video to show you the evidence. 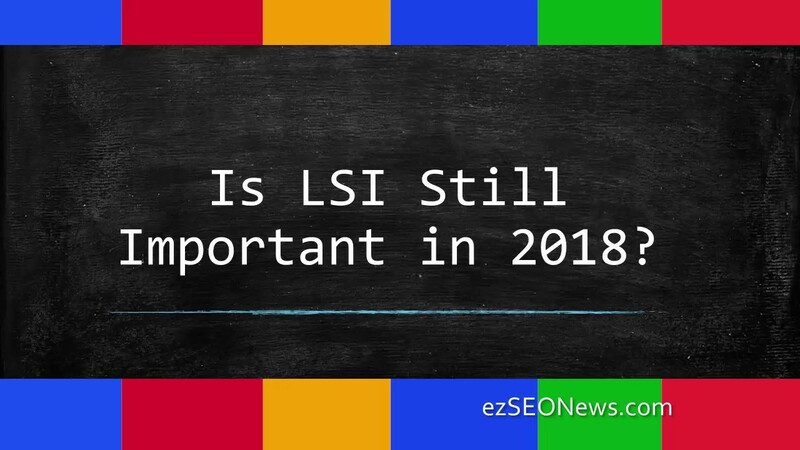 Not only will you see just about every single page in the Google search results obeying basic LSI techniques, but you'll also see evidence that LSI is becoming more important to ranking, not less. But how exactly do you take advantage of this knowledge? How do you create content that uses LSI for better theming of website content? How to use theming to optimize for any phrase you like, but in the process, actually optimize your page for hundreds or even thousands of related long-tail phrases. The truth is, Google is looking to wipe out ALL content from the SERPs if it has been “engineered” to rank well by optimizing around specific keywords. Using a keyword phrase 3 to 5 times every 100 words within an article is just not natural. It used to be that Google wanted these “hints” to tell it what a page was about, but today, it considers this type of keyword focused content as spam. Web Content Studio was created at the end of 2008, beginning of 2009 to help webmasters create content a different way – a way that mimics natural writers. Suppose you identify the phrase “how does insulin work” as one go want to rank for. The old keyword-focused method would be to get that phrase into the title, H1 header, opening paragraph etc. Reading the article, you’d know what phrase was being targeted by the webmaster because you’d see it repeated where it wasn’t actually necessary. In other words it was FORCED into the content in an attempt to get it to rank for that phrase. A medical expert would write about “How does insulin work” naturally without focusing on specific keyword phrases. The exact phrase might be used, but only where it makes sense to do so. There would be no requirement to get that phrase into the body of the article. Instead, the article would be written naturally, with words and phrases being used when they were needed, in the context of the best possible article on the topic. The article would no doubt have words like: blood sugar, glucose, insulin, regulate, pancreas, blood, circulate, liver, muscle, beta cells, secrete, globulins, etc. These are the theme words and phrases that would be REQUIRED in an authoritative article on the TOPIC “How does insulin work”. In one method, you concentrate on one main keyword phrase (OK, you sprinkle in synonyms as well), whereas in the other, you concentrate on the topic. When a journalist is given a brief for a new article in a magazine, do you think they are told to write around the phrase “blue widgets”? Or is it more likely they’ll be told to write an article on “how blue widgets make our lives so much easier”. See how the first one is keyword-focused, and the second one is theme (or topic) focused? This is how you need to start thinking about content. “People may not remember that Google didn't create AdSense. They bought the semantic technology from Applied Semantics back in 2003”. "Applied Semantics is a proven innovator in semantic text processing and online advertising," said Sergey Brin, Google's co-founder and president of Technology. "This acquisition will enable Google to create new technologies that make online advertising more useful to users, publishers, and advertisers alike." So, Google certainly has access to technology that can help it understand words on a page in much the same way as a human. But how does knowing this, help us? Does an article written by an expert in a field repeat the same phrase at a density of 1%? 2%? 5%? They will write using the words and phrases that the NEED TO USE in order to write the best possible article on the topic. This software will tell you the words and phrases that you NEED to use, on ANY topic, as if you were an expert. It does this by analyzing the top ranked page in Google for the term you are targeting and bringing back the words and phrases used on those pages. After all, if Google is ranking them well, it must think they are the best articles on that topic. If you think about the content you write on your site, do you come across as someone who knows the topic you are writing about? Would someone actually learn anything by reading your article, or is it published on your site just to try to get an Adsense click? If someone started reading your article, would they want to read the whole thing, or would they think that the article was total fluff, and click the back button? If Google's technology can mimic human behavior, then your content must be written for humans. How does Web Content Studio Help you Write better Content? Suppose you have identified the following phrase as having good potential – copper kitchen sinks – and you want to write an article on it. What words would be expected in a good quality article on copper kitchen sinks? copper, sink, sinks, model, kitchen, bath, hammered, bathroom, Mexican, design, finish, custom, craft, hand, round, tile, finishes, bowl, drains, small, style, apron, farmhouse, double, bar. Looking at that list, don’t you think you’d need to use most of those words? Highlighted in yellow, it says that Google only really found 200 pages that offered any value. The other 1,149,800 pages are not included because they are TOO SIMILAR to the 200 displayed results. That’s quite interesting, isn’t it? But where it gets more interesting is that EVERY search phrase has a similar cut off. You'll find that Google always returns a very small set of pages for any query, usually in the range of 150 – 600 results. You may be thinking what’s so interesting about that? Well, by analyzing random pages, I have found that on average, ALL of these included results have one thing in common. They contain a high percentage of ESSENTIAL theme words. Let's look at a real example. Let's consider the top 10 pages first, then we'll look at those ranking lower down. That is 39 theme words found on at least 7 of the top 10 pages. Could it be as simple as thinking that quality content includes a core set of theme words & phrases? I think so, and I’ll show you why I think that. Google only rates 146 articles for the phrase astigmatism. 4.26 million other pages on this topic are not deemed worthy of showing you. Let's look at an analysis of random groups of pages taken from those 146. Disclosure: I removed some URLS from this analysis to sites like Amazon and Youtube which tend to rank for any term, based on their huge authority. Do you notice that even those ranking at the bottom of the search results contain a large proportion of the theme words? The reason all of the web pages included in the results page contain these words is because these words are ESSENTIAL to the topic of the search term. Do you think this is an isolated example I have chosen? Google shows just 299 results for this term at the time of writing. Here is the summary table of the results, showing the position of the web pages tested and the percentage of theme words used. Google returned 383 results for this search term. These 47 theme words were found on 7 of the top 10 pages in Google that ranked for the term gestational diabetes. In this case, the pages in the main index averaged around 70+% of the 47 theme words. I could go on with more examples, but I think you get the idea. From the work I have done, I have seen time and time again that the pages in the main index, on average, are well themed around a core set of theme words. This is actually what you would expect from a quality article if you think about it. Without most of these words it's impossible to write a good article on the topic. I am hoping that a penny has dropped as you have read this page. What you have seen here is that Google is ranking well-themed, quality content in its main index. In fact, even those that are ranked at the end of the main search results are of a good quality. If your content is not well-themed, you better hope your site has huge authority to help it rank. I have been working with themed content since 2005. It's my not so secret weapon in getting my own content ranked. My newsletter subscribers have heard me drone on about it over the years. But wait… There is even more good news for those who theme their content…..
…..You never have to optimize content for the long-tail, every again! Theming a page automatically “optimizes” your page for long tail phrases. In the last month, this page was found for 247 DIFFERENT keyword phrases. …. 1632 DIFFERENT long tail phrases. .. 3078 DIFFERENT keyword searches! Those pages ranked for a huge number of different keyword phrases, naturally. The only reason they were so successful in sucking in the long-tail traffic was because they were well-themed, and contained all of the relevant theme words. The same theme words, incidentally, that make up the long-tail phrases themselves. Yet as you can imagine, very few (if any) of the long-tail phrases the page ranked for were found on the webpage itself. Spiders top X results in Google (or URL list). You decide how deep you want to dig. Export LSI keywords to the WYSIWYG editor, a text file or the clipboard. Take full control of the spider with a manual spider option. Theme reports to check your article theme. Notes & Grabber feature for article research. Spiders top 10 results in Google. 3 levels of digging for theme words. Export LSI keywords to a text file or the clipboard. These products comes with a 60 day no question asked guarantee. Try for 60 days, and if you do not like it for any reason, ask for a refund and I’ll give it to you in full – no questions asked.